A lot has been written about the big $19B acquisition of Whatsapp by Facebook. My intent is not to write specifically about the acquisition and its merits, or critique it, or debate if the price was too high or too low. Instead, I wanted to share some thoughts about why Facebook finds itself in this position of having to acquire young upstart companies for insane amounts of money. What has brought Facebook to this point? Will its next acquisition cost Facebook much more than $19B? 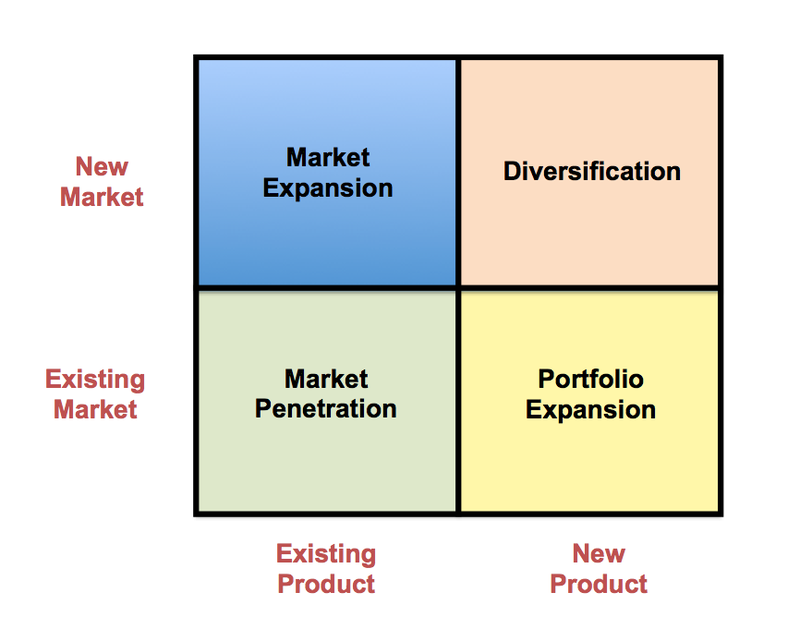 Let’s use Ansoff’s Product/Market Expansion Model to understand how businesses grow. I’ll only briefly summarize this model so we can get to the actual topic of Facebook. As one can imagine, most companies start off in the lower left quadrant with one product being sold into a market segment. In order to grow, the company has to ensure it outperforms all its competitors in order to become the 800 lb gorilla. This is usually measured by market share, some way of measuring the spoils by which the winners are celebrated and losers are relegated. The winning companies demonstrate agility in building product that meets and exceeds customer needs, are masterful in communicating the value of their product such that they have no problem extracting dollars for value delivered, and have efficient sales and channel operations. In other words, a company has to hit on all cylinders to continue to penetrate the existing market with their product and come out with a bigger share of the pie. As one market segment is captured and the growth of share in that market segment slows down, the company looks to additional sources of growth. The company starts to look for market adjacencies. Lets expand to Europe, or Asia, or BRIC. Surely those regions of the world are likely to have similar types of customers with similar problems and needs that we have solved before. Another example of market adjacencies, besides geographical expansion, is to look for new industry verticals. Lets expand from financial services to healthcare. Surely those companies also have regulatory requirements. With minor changes, e.g., localization, or supporting additional compliance rules and regulations, the existing product can be tailored to target a new market segment, spurring additional growth. It does carry a little more risk than plain Market Penetration because the company cannot rest on its success in the old market segment. It has to earn its way into the new market segment although it may be able to leverage its positive brand equity from the old market segment. Another strategy for a company to grow is to look for new problems to solve for the customers that it serves in the existing market segment. After all, the company is already the beneficiary of long held and well nurtured customer relationships. Why shouldn’t this customer intimacy be leveraged? It is much easier and less expensive to “upsell” a customer to a new product which serves a different need. Thus, the company goes from a one-product company to one that steadily adds new products to the stable. This requires the company to be very good at interacting with its customers to ascertain new pain points, needs to serve and problems to solve, and then create the right product that addresses those. While it is not a given, the company has an advantage in leveraging its existing relationship to motivate a customer to try and buy the new product, than another company that is trying to solve the same problem. Even though the company may build its products separately, it may combine the products into a single package or suite for making it attractive to buy. Customers prefer to purchase Microsoft Office and not Word, Excel, Powerpoint, Outlook separately. Organic growth from the three strategies above is usually achieved over a number of years, through disciplined product development, marketing and sales. When a company is faced with slow growth across its markets and product categories, it looks for inorganic opportunities for growth. This is when companies acquire a position into a new market, by acquiring another company’s products, technology, customer relationships and competitive advantage. An acquisition short-circuits the timeline to growth by literally creating growth potential overnight. The companies take great pains to articulate the “synergies”. This is the riskiest strategy because it entails a lot of uncertainty. How will the two companies “integrate”? Will the cultures of the two companies clash? Who will remain in charge? How will decisions be made? What happens to the product roadmap? And many such questions take precedence. An example of this diversification is Symantec acquiring Veritas to diversify from security to storage. Outside the tech sector, Coca-Cola acquiring Minute Maid and Odwalla are examples of diversification from aerated beverages to juices and smoothies. Let’s come back to Facebook and Whatsapp. By acquiring Whatsapp, it seems like Facebook is diversifying from being a provider of social networking platform to being a provider of messaging services. It seems like an attempt to get into new markets (countries with low smartphone penetration) with a new product (messaging services). Let’s also apply the Ansoff Product/Market Expansion model to Facebook’s evolution. Facebook executed the Market Penetration and the Market Expansion strategies very well to become well entrenched in the lives of over a billion people all over the world, no mean feat. It had to overcome well known social networking platforms like MySpace, and has to constantly compete for it’s users’ share of time. However, I wonder if Facebook missed a trick in it’s Portfolio Expansion strategy. Instagram and, more recently, Whatsapp responded to distinct needs, those of photo sharing and messaging respectively. For Facebook these capabilities were simply new features of an existing product. In fact, these were already features of the Facebook product long before the new companies came about. Facebook added photo sharing in 2005 whereas Instagram was launched with that plus filters in 2010. Facebook launched real-time chat in 2008 whereas Whatsapp got off the ground in 2009. Facebook had an opportunity to create a messaging product separate from the social network product. It could have uncovered unmet needs and been in a position to address them better. It could have treated “the need to send messages in real-time” as a new problem to solve rather than thinking of “chat” as a new feature to provide. It could have been in a better position to leverage the existing relationship to get customers to use its messaging product over existing alternatives. Similarly, Facebook had an opportunity to create a photo sharing product separate from the social network product. It could have treated “the need to share photos with special effects” as a new problem to solve rather than thinking of “posting photos” as an extension of posting text updates. In both cases, it could have leveraged the existing customer intimacy and “integrated” the products to create a seamless experience. Diversification to move into a new product category selling into a new market is an expensive proposition, with $1B being peanuts as compared to the $19B. If it does not think about problems to solve as discrete needs, or as Clayton Christensen calls, jobs to be done, Facebook will have to set more billions aside to buy the next company that’s takes one of Facebook’s existing “features” and runs with it. « Here’s my Facebook movie!…ENOUGH!